Blades By OEM - Shop Our Selection Of OEM Knives Today! | Carolina Knife Co.
Carolina Knife Co. manufactures industrial blades for a wide range of original equipment manufacturers (OEMs) in a variety of industrial conversion and processing industries. Below is a list of the primary industries that we serve followed by a list of the best-known OEMs that we manufacture from each industry. Don’t hesitate to contact us if you don’t see your OEM listed, because we also specialize in manufacturing custom industrial blades, which are often priced below the OEM price for replacement blades. Akron Standard Shear Blades are an aftermarket part manufactured from the highest quality tool steel and ground to the highest of tolerances. These shear cutting blades are used in either the manufacturing or testing of large and small tires for both consumer and industrial use. Tool steels for shear blades are usually of the D-2 variety or better. Special steels have been developed for other blade manufacturers that can be adapted to the Akron Special Machinery cutting system. The blades being manufactured are tested throughout the manufacturing process to insure that the hardness tolerances and the physical numerical requirements are being held to within our specifications. Shipment of Akron Special Machinery shear blades can be as quick as a few days if a previous stocking arrangement has been worked out. If no stocking arrangement is in place, then quick delivery can be arranged through the use of Carolina Knife's steel inventory. Fischer blades, both straight and circular slitters and manufactured from high quality tool steel, hardened to the proper Rockwell C scale. This generation of equipment is considered to be on the leading edge of the tire and rubber manufacturing industry. The Fischer tire and rubber manufacturing equipment is a fine piece of manufacturing equipment. Carolina Knife Co. manufactures the circular 7.00 inch O.D. square edge slitter blades from both steel and solid carbide material. This style of slitter blade has proven to be a workhorse in the manufacturing of tire and rubber products. Carolina Knife Co. stocks this blade in D-2, powered metal and solid carbide material. The sharpening of the Fischer style slitter blades is done by Carolina Knife Co. on wet surface grinders to prevent the burning of any surface. The rotary 7.00 inch O.D. Fischer is sharpened on a rotary CNC surface grinder. All OEM surface finish and dimensional tolerances are maintained. Most of the sharpening can be perform in just a few days, and emergency sharpening service can be performed if needed. Sadone machines and machine blades are efficient cutters and processors of tire and rubber material used in the manufacturing of tire and rubber products. Spadone-Hypex also manufactures blades for the plastics and food processing industries. Many of the replacement blades made for after market users on Spadone machines are made of M-2 high speed inlay material that is in excess of 6 Rockwell on the "C" scale. This will increase the run life of the knives resulting in increased productivity, and therefore lower costs. Carolina Knife Co. has extensive experience manufacturing, sharpening, and servicing Spadone blades for the tire and rubber industry. Knife manufacturing and service is a combination of technique and technology, which can only be acquired form years of being in the business. Many of these techniques hare passed down over the years enabling superior efficiency and therefore lower costs. Many times the cost of transportation to and from out plant costs more than the actual service of the blade being serviced, we are that efficient. There a various lengths of the Spadone blades and cutters in the field. Contact us to see if we have documentation on your particular Spadone blade. The Calemard system is used in the many different textile converting applications. This style of blade is used in both conventional and specialty types of slitting. Most of the Calemard slitter blades are made from high quality tool steels and precision ground to exacting tolerances. Many of the Calemard blades Carolina Knife Co. manufactures are made from M-2 tool steel and hardened to a Rockwell of 62-64 Rockwell C scale. This is to insure a long, productive run life during the material manufacturing process. Carolina Knife Co stocks some Calemard blades. Others can be manufactured quickly from its own steel stock that we maintain on the floor at all times. The Calemard Machine is a fine machine that great blades only make better. Carolina Knife Co. can supply those blades. Cameron machines, including slitter rewinders, have been a mainstay in the converting industry for many decades. The rights to this machine have recently been purchased by GL&V (GLV), and they maintain a stock of parts, including spare slitter blades for this machine in their stock. Carolina Knife Co. also stocks and manufactures slitter blades, and other knives for the Cameron machine. The steel types range form 52100 to D-2 steel and also some carbide materials. The score cut Cameron machines can also be fitted to hot cut the material with very little changeover from the existing score cut set-up. There are Cameron machines in the field that can score cut, rotary shear cut, and razor cut. Not at the same time but with a change of tooling; all on the same machine. Cameron machines are primarily used in the converting of paper, film and foil. Carolina Knife can manufacture blades for each step in the converting process, including the three aforementioned methods of slitting. We maintain a wide range of replacement blades in stock ready to go. John Dusenbery was a pioneer in the manufacture and adaptation of cutting equipment during the post World War II era of the American Industrial revolution. John Dusenbery Company machine designs included score, razor and shear slitters as well as other types of production specific slitting methods, some of which are no longer used in the converting process. These machines are commonly used in the manufacturing of textiles and nonwoven fabrics; the slitting of paper products; and conversion of film and foil materials. Carolina Knife Co. manufactures and stocks many of the consumable products that were originally designed into the Dusenbury Company converting machinery. Whether you need hardened sleeves, top or bottom shear slitters or score knife holders; Carolina Knife Co. has an inventory of over 4000 different part numbers to answer your inquiries. The majority of John Dusenbery slitter blades are manufactured from 52100 tool steel and hardened to a Rockwell of 62-64 Rockwell C scale. All the cutting blades and hardened sleeves designed by the John Dusenbery Company can be service to a like new operating condition through the process of re-grinding. Carolina Knife Co. can resharpen any of these parts in industry leading turnaround times. All sharpening is performed with coolant so as to not burn the cutting edges. The Goebel slitter rewinder is a machine manufactured in Germany designed to convert webs of paper, film, and foil materials to smaller widths. It uses a shear slitter knife design and is considered fast and easy to set up. Carolina Knife Co. manufactures and services the blades needed to operate this machine. Most Goebel slitter blades are maintained in stock at the Asheville, NC facility. They are stocked in both D-2 and 52100 materials and can usually be shipped on the same day the order is placed. All Goebel bottom slitters manufactured by Carolina Knife Co. are lapped for thickness to a + or - .0002 tolerance so an accumulated slit error will not occur, because it will not be built into the set-up. Closer tolerances on the overall lapped thickness can be held. Sharpening of all Goebel slitters can usually be completed in the same day at the Carolina Knife Co. plant. Care is taken to maintain the close tolerances needed time after time to set-up the Goebel slitter machine. Carolina Knife Co. uses only the most effective abrasives to manufacture and resharpen Goebel slitters, and then only to OEM specifications. Goodman cuttr blades are semi circular, half moon shaped cutters that cut as product extrudes through its process toward the knife edge. Carolina Knife Co. can manufacture the Goodman cutter blade from standard 52100 material or a higher grade tool steel that will affect a longer useful life of the cutter. Sharpening is a standard procedure for this knife. Carolina Knife Co. can resharpen the Goodman cutters to a like new condition. Because of this they can be used many times reducing the cost of the knife over many uses. The higher grade tool steels that are used in the manufacturing of Goodman cutter are D-2 and M-2 tool steels. Care must be taken during manufacturing to insure that the blades are not too hard, which may cause breakage of the blade during operation. Kidder-Stacy is an old established converting name here in the United States. Carolina Knife Co. manufactures a line of bottom slitter knives for the Kidder Stacy from 52100 and D-2 material. Most of these bottom knives have an O.D. of less than 5 inches, and in most cases are manufactured from 52100 material. It is possible to manufacture these blades from M-2 or powered metal material, but because of the run speeds of the machine it would not be cost effective. Sharpening of the Kidder Stacy blades is a simple task that we often perform at Carolina Knife Co. The delivery of resharpened Kidder Stacy blades usually runs 2 to 3 days turnaround time. Carolina Knife uses coolant on all of its sharpening machines so burning is not an issue. Tidlad converting equipment has become the most popular domestically produced slitter blades for the converting of paper, film and foil products. Carolina Knife Company has begun manufacturing and stocking top and bottom slitter knives for Tidland slitting equipment. Carolina Knife Co. manufacturers these slitter blades in a wide range of materials; from 52100 through CPM 10V. Carolina Knife Co. domestically manufactures and stocks many sizes of Tidland slitter blades and shafts in these materials. Carbide tipped bottom slitter blades can be quoted on a as needed basis on all of the bottom or female knives. Along with manufacturing a full line of top and bottom paper, film and foil slitter blades and shafts for Tidland converting machinery, Carolina Knife Co. also specializes in sharpening and regrinding these blades and shafts. Sharpening is one of our specialties, not a sideline business. Contact us today to schedule a sharpening job for your Tidland slitter blades. Beloit top and bottom paper slitter blades are manufactured from grades 52100 through powered metal quality materials. Beloit, Lenox and GL&V (GLV) all provide OEM equipment for the converting industries, especially the paper industry. 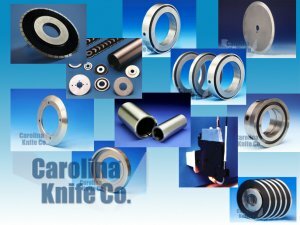 Carolina Knife Co. manufactures and sharpens blades for all these machines and many other OEMs from the paper conversion industry and other related industries. The cutting tip or edge of bottom knives can be manufactured from carbide material, which will greatly increase run life. Powdered metal is not as common on bottom knives as it is on top slitter knives, but can be a cost effective alternative to either carbide or ceramic material. Choosing the right style of high speed paper manufacturing equipment and blades is essential to getting the most out of your manufacturing process. Style refers to all elements of what is inherent in the tool, including material, hardness, cutting angle, or edge sharpness. Allow the experts at Carolina Knife Co. to help you find the correct style of blade for your individual needs. In 2000 Metso Paper Company acquired Beloit Technology Corp including to following Beliot Corp assets: roll servicing / covering (Beloit-Manhattan), paper machine after market, and paper machine technology. The Bieloatik is a European style cutter that specializes in high speed cutting and converting, especially sheeting of paper and related materials. Bielomatik sheeter knives and other Bielomatik blades can be manufactured from tool steel, ceramic or carbide. The productivity of this type machinery is much greater than the older style of paper converting equipment, and therefore the tolerances required are much more exact. After World War II many fine European machines began to enter the United States paper converting market to fill the need of a high production machine and blades at a reasonable price. These cutters still offer superior cutting speeds at a reasonable price. The material that the Bielomatik sheeter blades are manufactured from is largely D-2 steel. Although carbide inlay sheeters are sometimes used to increase run time and productivity. The Bielomatik product line is often associated with the Jagenberg paper conversion company. Carolina Knife manufactures blades for both of these companies as well as many other paper conversion OEMs, listed below. Bielomatik sheeter blades are sometimes referred to as folio sheeters. Black Clawson has a storied history in the manufacture of paper making machinery. Carolina Knife manufactures many Black Clawson roll splitters and paper slitter blades for paper mills across the globe. These blades are manufactured form 4150 material and hardened to a Rockwell of 58-60 on the C scale. Our plant in Hamilton Ohio manufactures Black Clawson pelletizer knives that are used in the production of plastic pellets in the oil refining industry. These blades are made form D-2 tool steel and hardened to a Rockwell of 58-60 on the C scale. In addition to the manufacture of the blades we also can do maintenance work on the extrusion heads that the molten plastic passes through. Black Clawson slitter blades are designed to perform as a high speed roll slitting mechanism that can convert a roll of paper, off the paper machine, in rapid order. Blades manufactured by Carolina Knife Co. are used in many instances on these machines and are designed to perform at high speeds. Clark Aiken sheeter knives are sharpened, serviced, and manufactured by Carolina Knife Co. The longest Clark Aiken sheeter knife is 88 inches long. The top blade is pie shaped and the bottom knife is rectangular in shape. Material on this type knife is almost exclusively T-1 High Speed Steel, hardened to a Rockwell of 62-64 Rockwell on the C scale. M-2 steel is sometimes used in the inlay of the cutting edge. The difference is run life of the cutting set up. Most manufacturers find it advantageous to use the better grade T-1 High Speed Steel. When running, this top and bottom knife cutting combination make a clicking sound as the blades touch slightly together and cut the web material. For this reason – this set up is also know as a stop cutter, because for a split second, right at the cut point and at the moment of impact the cutters “stops” to perform the work it was designed to do. When you talk about high speed paper mill production in the post World War II era, E.C.H Will comes to the forefront of conversation. Carolina Knife Co. manufactures and services both the slitter blades and the sheeter blades needed in the high speed converting process. Because of the operational speed involved in this paper cutting process, close manufacturing tolerances are needed for these blades. All of the E.C.H. Will cutting blades are made from a minimum of D-2 tool steel. As time has passed, more and more of the blades have moved up to CPM 10V powered metal type materials. This is to ensure a longer run life once the highly technical set up of the blades has been established. The ECH Will sheeter knives, in some instances and carbide tipped to further increase the run life of the blade. These blades like most others can be resharpened, but tight tolerances must be upheld. Closer tolerance jigs and fixtures must be built to maintain these tolerances. At Carolina Knife Co., it takes only a few days to complete this sharpening since we already have the jigs and fixtures built to perform the process. All blades are sharpened using coolant to keep the blades from burning. Hamblett is a name that is associated with straight blade “stop” cutters used primarily in sheeting paper products and their derivatives. In post World War II America Hamblett was a name common throughout the paper making industry. Almost all Hamblett sheeters are made from T-1 High Speed Steel, or what is commonly called inlay product. T-1 can cut for long periods of time without needing sharpening and has proved an efficient and durable material from which to manufacture these types of blades. Carolina Knife Co. stocks much of the T-1 inlay material needed to manufacture Hamblett sheeters and can resharpen these blades to a like new condition. Slitter blades are also used on many Hamblett machines to trim the edges of rolls of paper as it is sheeted to size. Carolina Knife Co. can manufacture and sharpen these Hamblett slitter blades as needed by our customers. Jagenberg Machine Company is a manufacturer and supplier of paper mill and paper converting equipment. Carolina Knife Company manufactures a line of top and bottom slitter blades as well as sheeter knives for this machinery. All Jagenberg equipment is considered to be state of the art high speed paper converting and manufacturing equipment. Caroling Knife Company’s specialty product in the Jagenberg line of blades is the multi-groove bottom knife block. These bottom knives can be either single or double cutting edge and made from D2 or 52100 tool steel. The Rockwell C-scale hardness on all these knives is approximately 60-62. We also manufacture carbide tipped blades for Jagenberg paper converting machinery. Along with manufacturing a full line of paper slitter blades for Jagenberg paper machinery, Carolina Knife Co. also specializes in sharpening and regrinding these blades. Sharpening is one of our specialties, not a sideline business. Contact us today to schedule a sharpening job for your Jagenberg slitter or sheeter blades. Jagenberg is often associated with the Bielomatik line of slitter blades because these two paper converting companies merged several years ago. For more information on the Jagenberg and Bielomatik line of paper slitter blades please visit: www.bielomatik.com. Kampf slitter blades are of a European origin as is the slitting machinery they accompany. The Kampf circular slitters rotate at high speeds to affect exceptional cutting rates with high quality on a variety of different web products. Carolina Knife Co. makes a complete line of Kampf top and bottom slitter knives to be used in the conversion of paper, film, and foil products. These are comprised of 52100, D-2, M-2 tool steels, and powdered metal. Tool steel selection is important for Kampf high speed slitter blades. To aid that process we have generated a Steel Selection Guide to educate our customers in the different types of steel available. This is available on our Educational Resources section. Besides manufacturing top and bottom blades for Kampf machines, Carolina Knife Co. also sharpens slitting knives to a like new condition. Our delivery on this process generally runs 2 to 3 days and in most instances the sharp edge is better than new.